Kansas guard Rio Adams defends against Texas Tech guard Daylen Robinson during the second half of the second round of the Big 12 tournament on Thursday, March 14, 2013 at the Sprint Center in Kansas City, Missouri. • Matt Lombardi, the editor-in-chief for the blog College Spun, did a study to try to determine the most successful men’s college basketball NCAA Tournament teams in the 21st century. After adding up all the numbers, KU was No. 1 in the rankings with 68 points. North Carolina was second with 64 points. Lombardi said at first he was surprised that the Jayhawks ended up on top, but he then cited the Jayhawks’ consistency as the reason they took the No. 1 spot. • The Jordan Brand Classic high school all-star game is taking place Saturday in New York City, and in the last day, there have been some highlight videos posted of KU signees from the pregame workouts. 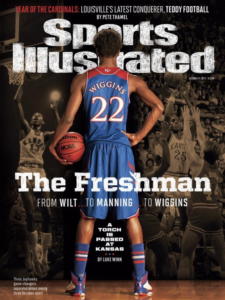 • One last recruiting item: KU remains in the race for the class of 2013’s No. 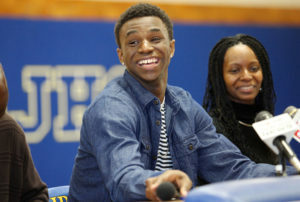 1 overall player Andrew Wiggins, who is also considering Florida State, Kentucky and North Carolina. His highlight film is worth a look if you haven’t seen it yet. • College basketball analyst Ken Pomeroy points out a statistical oddity that relates to KU in his latest ESPN column (subscription required). Remember when KU freshman guard Rio Adams exploded for 11 points on 4-for-5 shooting in KU’s 91-63 victory over Texas Tech in the Big 12 tournament? Adams needed just 4 minutes, 43 seconds to put in his 11 points. 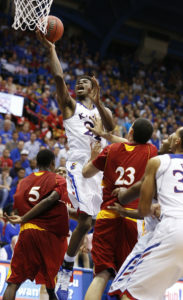 • SI.com’s Seth Davis has KU ranked No. 13 in his not-too-early college basketball preseason poll for 2013-14. Davis, who admits in the article much of KU’s high ranking is based on coach Bill Self’s history of churning out winning teams, does not have any other Big 12 schools ranked in his top 25. • And finally, a couple months ago I was introduced to the song “Withey, Without You” via a friend on social media. I watched it once, forgot about it, then had it reverberate again in my head once again this week. Maybe it’s the “We can’t win … Withey without you” lyric. I don’t know. But here it is. Good luck getting it out of your head.